Marijuana has grown to become a $400 million industry in Arizona, but nine years after medical marijuana was legalized in our state, there is still confusion about how the law treats pot in Arizona. In early 2017, Adam Wanko was getting desperate. He was battling throat cancer and undergoing chemotherapy. He was dropping weight fast -- 85 pounds in just six weeks. That's when his oncologist recommended marijuana. It would ease his symptoms and his nausea, and he could regain his appetite. Adam did what more than 180,000 people have done in the state of Arizona since 2011: He obtained a medical marijuana card from the state Department of Health Services. He purchased wax, a type of concentrate, at a local dispensary. He thought everything he was doing was legal. Medical marijuana laws in Arizona: What is legal and illegal? On March 17, 2017, Wanko was stopped for a traffic violation and soon found himself facing up to ten years in prison for possession of a narcotic drug, the very wax he had purchased legally just days before. "I'm being prosecuted right now for something that I wasn't even aware that I was breaking the law, and actually I don't think I was breaking the law," Wanko said. "I think it's a misinterpreted law right now." Wanko was stopped in Yavapai County, where county attorney Sheila Polk's interpretation of the state's criminal code and the medical marijuana law passed by voters in 2010 has already landed one man in prison. Wanko faces the same fate. Through a spokesperson, Polk refused to comment on pending cases, but the long-time opponent of marijuana in any form has threatened to upend the enforcement, and some say the intent, of the medical marijuana law. In March, the state supreme court will decide if she's right. Polk's argument centers around a discrepancy between the state criminal code, which defines cannabis as an illegal drug, and the medical marijuana law, which she claims, only applies to marijuana in plant form. State dispensaries sell a wide variety of products derived from marijuana -- from edibles to oils, to concentrates. Polk says those derivative products are illegal, although she would not say why her office hasn't prosecuted any dispensaries in Yavapai county which sell the products under state license. Polk has already gained a conviction in the case of Rodney Jones, another marijuana cardholder, who is currently serving two and a half years in prison. The conviction was upheld on appeal. The state supreme court will hear oral arguments on the case on March 19. 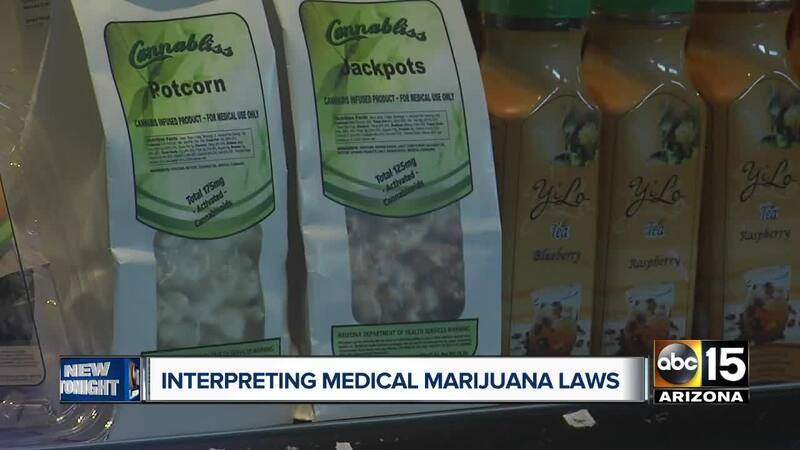 "When you go into a store licensed by the state, you have no notice that it's illegal," said Jared Keenan, an attorney, with the American Civil Liberties Union. "In fact, you have every notice that it's perfectly legal." The ACLU and others, have filed briefs in the Jones case, arguing the intent and the language of the state's medical marijuana law allows for marijuana in multiple forms. If the Yavapai conviction is upheld, it could open the door for prosecution in the state's other 14 counties, and potentially leave tens of thousands of cardholders in legal limbo -- not knowing whether they can purchase certain marijuana products. The ACLU argues, for some patients, there's no choice, "specifically young children who suffer from awful seizure disorders who can only get relief from CBD oils and THC oils," Keenan said. Polk's strict interpretation has not met with widespread support, even from her own party. Republican Attorney General Mark Brnovich, whose office normally defends cases at the appellate level, has refused to defend the Jones conviction, leaving Polk to argue the case on her own. No other county prosecutor has attempted to bring a case on similar grounds. Rep Tony Rivero, a Republican from Peoria, has introduced a bill attempting to revise the criminal code, by redefining cannabis and what amounts to illegal possession. If HB-2149 passes and is signed into law, cardholders would be exempt from prosecution for possession of marijuana in any form. It's unclear if a new law would protect Adam Wanko, whose cancer is now in remission. Wanko faces a sentencing hearing on his conviction and could be sent to prison before a new law is passed or the supreme court weighs in. "If anyone could tell me how I could do things differently, from the time my oncologist told me to explore marijuana, to the time I got arrested, I'm all ears," he said.